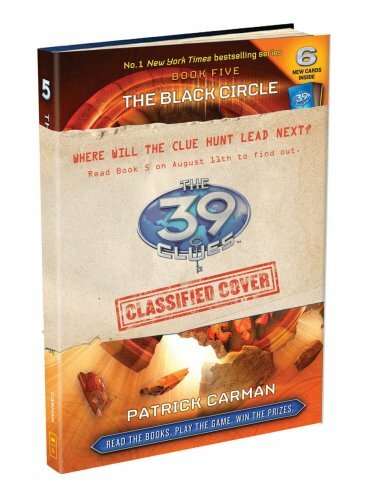 NEW YORK, NY (August 11, 2009) — The global hunt for The 39 Clues®, the New York Times bestselling multi-media adventure series from Scholastic, continues today with the release of Book 5: The Black Circle by bestselling author Patrick Carman. The hardcover edition is being released simultaneously in the United States, United Kingdom, Canada, Australia, New Zealand, Malaysia, Singapore, and India, along with the audiobook edition produced by Scholastic Audio. Worldwide interest in The 39 Clues continues to heat up. Scholastic announces today that the series has been licensed for publication in 17 foreign languages, including Japanese, Italian, German, Chinese, French, Greek, and Hebrew. The 39 Clues launched in Scandinavia this past spring with the first three books released in Finland, Sweden, Denmark, and Norway. This summer, the series also debuted in Japan with the publication of books 1-3. Additional international editions are scheduled to launch in spring and fall 2010. The 39 Clues interactive reading experience continues to gain momentum online with even more kids from all 50 states and 191 countries joining the hunt for clues. The 39 Clues online game has drawn more than 580,000 registered users since its launch in September 2008. In June, following the publication of Book 4: Beyond the Grave, Scholastic introduced an online campaign, “Where Will Amy and Dan Go Next?” which led kids to investigate the mystery surrounding Amy and Dan Cahill’s next global destination. The campaign featured a 6-part exclusive video report, which included interviews with authors Jude Watson and Patrick Carman. The campaign culminates today with the revelation of Amy and Dan’s location in Book 5: The Black Circle. The 39 Clues launched on September 9, 2008, with Book 1: The Maze of Bones by Rick Riordan, which debuted at #1 on the New York Times bestseller list. On December 2, 2008, Book 2: One False Note by Gordon Korman was released and also debuted at #1 on the New York Times bestseller list. Since the release of Book 3: The Sword Thief by Peter Lerangis on March 3, 2009, the series hit the New York Times, USA Today, Publishers Weekly, and Wall Street Journal bestseller lists and has more than 4 million books in English in print for books 1-5. Book 4: Beyond the Grave by Jude Watson was released on June 2, 2009 and instantly jumped on to the national bestseller lists, hitting the highest bestseller list ranking for the series to date on USA Today. Movie rights for The 39 Clues have been acquired by DreamWorks Studios with Steven Spielberg eyeing to direct. The script is being penned by Jeff Nathanson whose credits include Catch Me If You Can and Rush Hour 2. The 39 Clues is a groundbreaking multi-media adventure series for children ages 8-12 that spans 10 adrenaline-charged books, hundreds of collectible game cards, and a website that allows readers to play a role in the story and compete for prizes. The series centers around the Cahills—the most powerful family the world has ever known. But the source of the family’s power has been lost. Grace Cahill, the last matriarch of the Cahills, changed her will minutes before she died, leaving her descendants an impossible decision: receive a million dollars or a clue. The first Cahill to assemble all 39 clues hidden around the world will discover what makes the family so powerful—a reward beyond measure. It’s Cahill versus Cahill in a race to the finish, with readers hot on the heels of the main characters, fourteen-year-old Amy Cahill and her eleven-year-old brother, Dan. The series highlights famous historical figures kicking off with Benjamin Franklin in The Maze of Bones, Wolfgang Amadeus Mozart in One False Note, Toyotomi Hideyoshi in The Sword Thief, and Howard Carter in Beyond the Grave. For more information about The 39 Clues and to download digital images, visit http://mediaroom.scholastic.com/The39Clues. Patrick Carman is the acclaimed author of the New York Times bestselling Land of Elyon series, as well as the Atherton and Elliot’s Park series. His innovative multimedia ghost story Skeleton Creek was published early this year with the second volume, Ghost in the Machine, to be published in October 2009. This breakthrough property engages readers through the combination of a written story and more than an hour of online video produced by Patrick Carman’s own PC Studios in Walla Walla, Washington. Carman has worked in advertising, game design and technology and spends his free time supporting literacy campaigns and community organizations. He lives in Walla Walla, Washington with his wife and daughters. For more information about Patrick Carman, visit www.patrickcarman.com. Scholastic Corporation (NASDAQ: SCHL) is the world’s largest publisher and distributor of children’s books and a leader in educational technology and children’s media. Scholastic creates quality educational and entertaining materials and products for use in school and at home, including children’s books, magazines, technology-based products, teacher materials, television programming, film, videos and toys. The Company distributes its products and services through a variety of channels, including proprietary school-based book clubs and school-based book fairs, retail stores, schools, libraries, television networks and the Company’s Internet Site, www.scholastic.com.